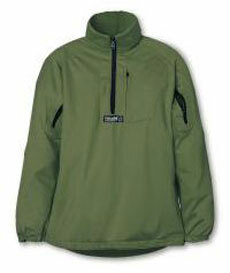 Radical 'through to skin' ventilation, via arm vents in the Mountain Vent Pull-on, a unique Paramo® advantage. Increased comfort from high collar. Quick and easy temperature control from deep chest zip. Increased freedom of movement from full arm and shoulder articulation. Further temperature control from pull up sleeves and adjustable cuffs. comfort and freedom of movement through shoulder and elbow articulation. Material: Designed to be reversible, the fabric used in the Paramo Mountain Vent Pull On has a 'smooth' side (for wicking moisture away when worn next to the skin) and a 'woolly' side (to retain warmth when worn next to the skin). When you change from one side to the other the difference is truly remarkable with both sides doing their respective jobs with stunning efficiency. Indeed, so much so that when I tried the shirt 'woolly side in' on a steady winter climb up Harter Fell (Eskdale) in the Lake District I quickly became overheated - though I do tend to 'run hot'. The zips have metal pulls on both sides and the metal pulls on the smooth side have extra material to aid zipping with gloved hands. But when wearing the shirt 'smooth side in' this extra material on the arm vent zips tended to nestle annoyingly in my arm pits. I solved this problem by wearing a thin base layer under the shirt. Washed extremely well and dried extremely quickly. Neither performance nor fit have changed even after large number of machine washes. Fit: Tester: Male 5'11'', stocky build. Fits well with a good length with plenty of material at the back to cover the lumber region when stretching. The Paramo Mountain Vent Pull On is a very effective reversible shirt that will keep you cool and dry when out walking - and then keep you warm and snug when relaxing in the evening. Performance and fit were sustained through multiple washings and the two garments-in-one claim held up well in our tests - saving weight on your back and money.